Red chalk (according to H. M. Calmann; see n. 1), c. 28.5 x c. 22.3 (derived from the scale on the photograph in the British Museum; see n. 1), the upper corners cut; laid down. The drawing is probably cut along the left edge; a flat curved shape that passes behind the elbow of the man at the far left suggests that the composition originally extended farther in this direction. PROVENANCE: Peter Lely (Lugt 2092). Prosper Henry Lankrink (Lugt 2090). Richardson Senior (Lugt 2184). Carroll, 1964 (1976), I, Bk. I, 5-16, II, Bk. II, 180-184, D. 3 (COPY? ), Bk. III, Fig. 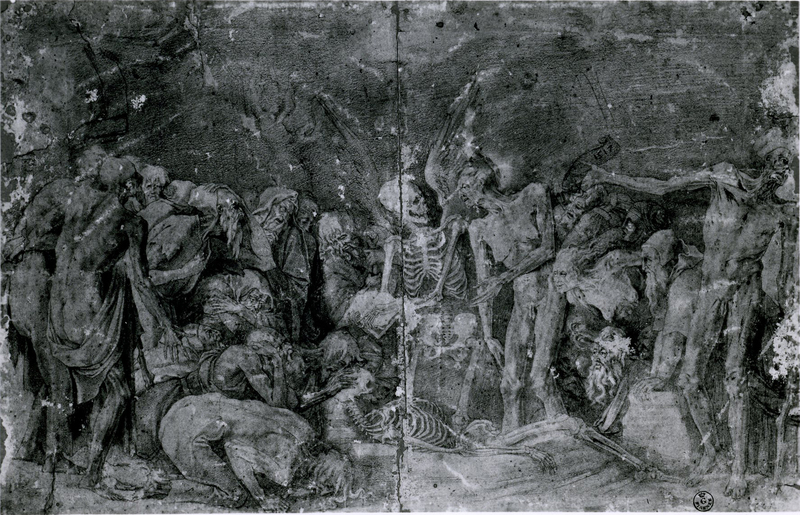 8, as probably a copy of a lost drawing by Rosso of ca. 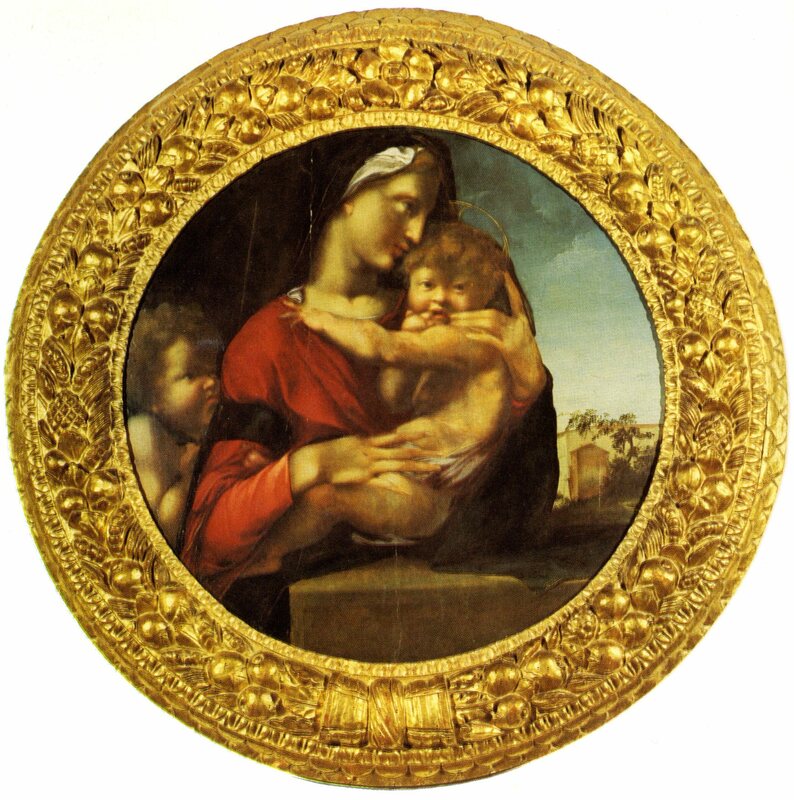 1515; and in 1976, vii, as not by Rosso. 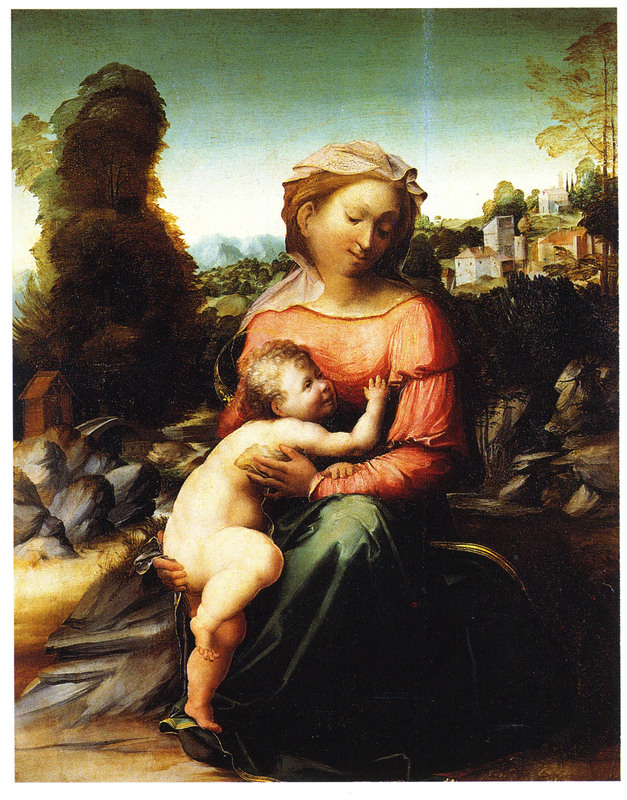 Carroll, 1971, 35, n. 31, as closely related to the Old Testament Scene in the British Museum, and as possibly by Rosso or by Alonso Berruguete. Turner, 1986, 154, under no. 112, as certainly by Rosso. Carroll, 1987, 58, n. 4, as not by Rosso. This drawing was brought to my attention by Philip Pouncey, who in 1959 attributed the drawing to Rosso. I accepted this attribution in 1964, although with the possibility that it was a copy of a lost original. By 1971 I already had sufficient doubts to think that it might instead be by Berruguete. It is not clear what the subject of the Clinton drawing is. I had thought that with the supposed missing part at the left it might have shown the Preaching of St. John the Baptist. But this need not have been its subject. 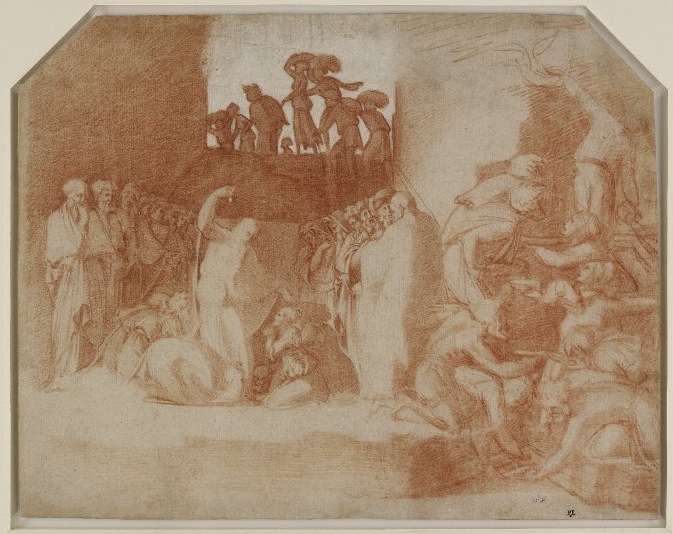 The fourth figure in front of the cliff in the Clinton drawing is quite specifically like the one at the right end of the major group in the Old Testament Scene in the British Museum (Fig.RD.19, recto), a drawing that has been given to Rosso but that I think is more probably to be associated with an assistant or follower of Bandinelli, perhaps Bandini, in the late 1540s when Bandinelli was conceiving the reliefs for the recinto of the choir of the Florentine cathedral. The Clinton drawing could be half of a figure group similar to that in the British Museum drawing. In any case the two are sufficiently alike to make one wonder how they are actually related. 1 A large clear photograph of this drawing in the British Museum (negative no. 8041), brought to my attention by Philip Pouncey in July 1959, bears the note: Clinton Collection, Hodgson and Co., London, 1958. Hodgson & Co. informed me in March 1961 that drawings were not included in their sale of property of the Clinton family. In 1964 it was in the collection of Miss Clinton. In October 1969 H. M. Calmann sent me a photograph of the drawing from London and stated that the drawing was in a private collection. 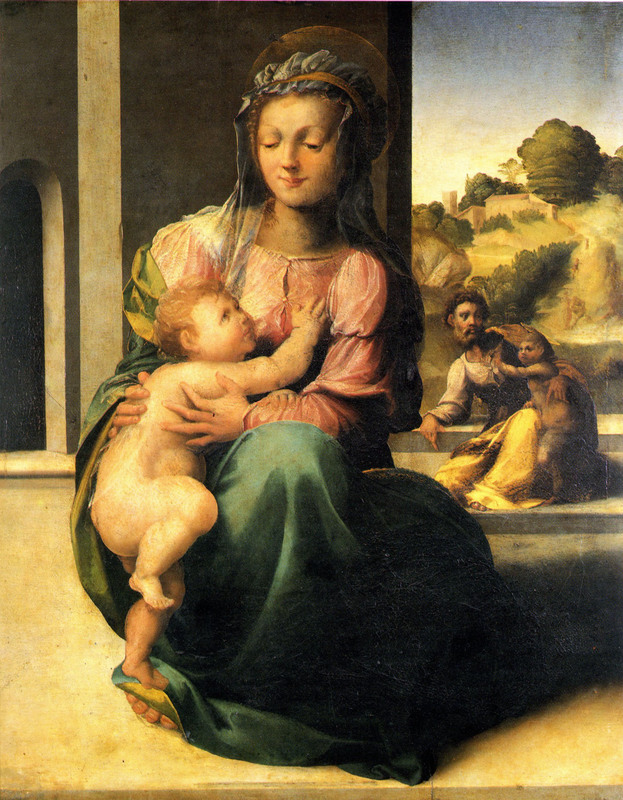 2 In 1964 I thought that details of the Clinton drawing were closely related to some in the Madonna and Child in a Landscape from the Uffizi (Fig.RP.6a) and the Holy Family in the Borghese Gallery (Fig.RP.20a), which had been given to Rosso and then by Zeri to the Master of the Kress Landscapes. But now their similarities do not seem sufficiently close to recognize the same hand in the drawing. 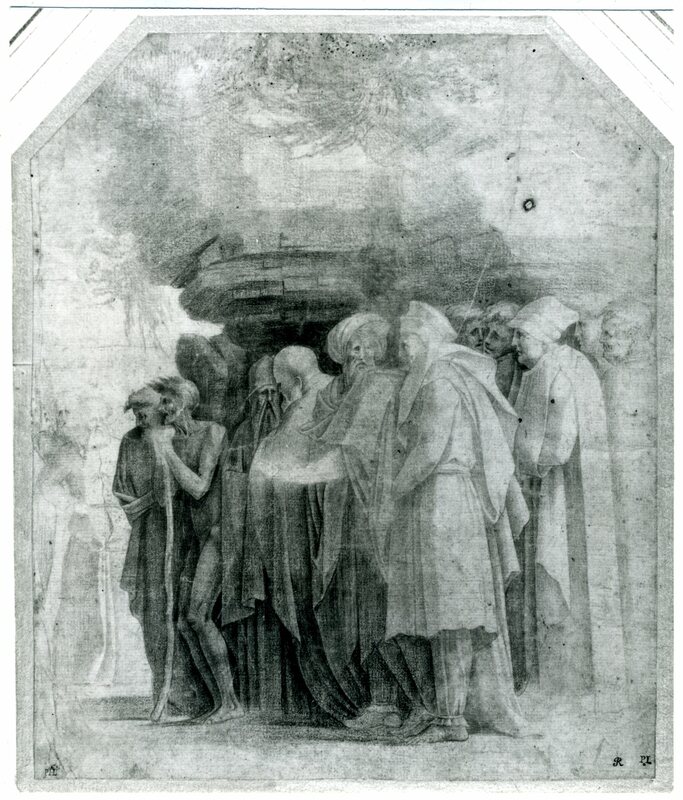 The association I made later with Berruguete was because of the smoothness of the drawing, which reminded me of the Loeser tondo (Fig.RP.9a), and because the head second from the right recalled the head of the Virgin in that painting. I still see these similarities but I cannot now argue that these are sufficient for an attribution of the drawing to Berruguete.